My name is Mir Hamza Hasan and I am a professional developer and designer having experience of more than 6 years in various fields. 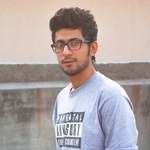 I am providing freelance services to this and...Read moreMy name is Mir Hamza Hasan and I am a professional developer and designer having experience of more than 6 years in various fields. I am providing freelance services to this and many other platforms as well. There is a list of services I can provide to my clients.